In José Esteban Muñoz’s now probably over-quoted introduction to Cruising Utopia: The Then and There of Queer Futurity, Muñoz describes, “Both the ornamental and the quotidian can contain a map of the utopia that is queerness” (1). Similar to Muñoz’s assertion, artist Anna Campbell works almost exclusively with “the ornamental and the quotidian” as a site for depicting and discovering queerness and queer relationality. Last week, I stumbled on Campbell’s compelling, complex and thoroughly queer exhibition Etiquette Kit at the Lower East Side’s BOSI Contemporary on sadly the last day of the show. While I try to keep Filthy Dreams essays current so you, dearest readers, can take a look at the exhibitions yourselves, Campbell’s masterful transformation of domestic and everyday objects into symbols of queer desire and life certainly deserves our attention. 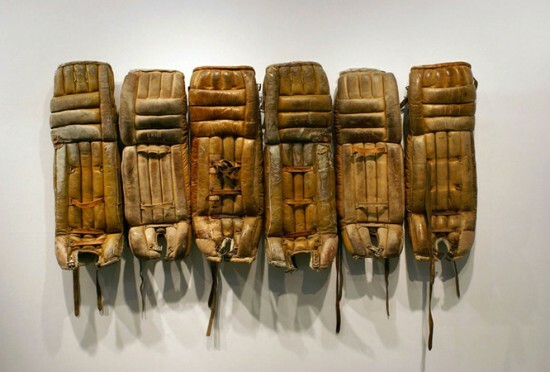 From wall-mounted works such as Ode To A Gym Teacher, created from worn hockey pads, to freestanding sculptures including Bridge and Tunnel for Walt Whitman, which combines a queeny fur hand-warmer over a construction resembling a bridge, Campbell examines topics as varied (and significant) as gender performance, queer history and the importance of queer nightlife. Weaving queer narratives through her richly symbolic material, Campbell’s Etiquette Kit proves that conceptual art can still be subversive, outspoken, political and provocative. 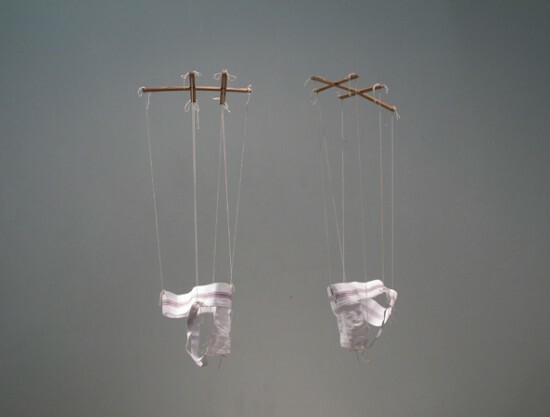 For example, Campbell’s hanging sculpture Coquettes (s, l) features two jockstraps–one small and one large–tied to puppet strings. In Coquettes (s, l), Campbell mocks the douche-y bro masculinity connected to locker rooms, as well as reveals hidden pockets of queerness within it by tying dainty bows to the handles at the top of the strings. Playing with homoeroticism, masculinity and even, female masculinity due to the small size of the jockstraps, Campbell’s work transcends the apparent simplicity of the materials to create a diverse dialogue about gender performance. Similarly, her sculpture Passing reflects the difficulty of passing whether as straight or queer. 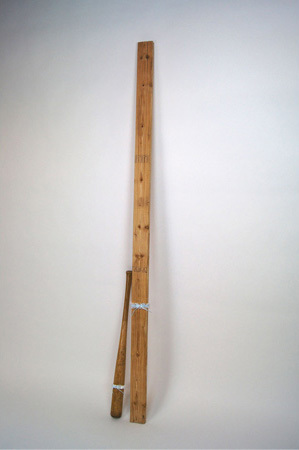 Hanging frilly garters on two typically masculine objects–a baseball bat and a wooden 2X4 beam, Campbell references both straight male culture and the stereotypical dyke passions of softball and construction (all that was missing was some flannel). By blurring the boundaries between masculine and feminine, Passing, much like many queers who pass, exists in a complicated position somewhere in between this binary. 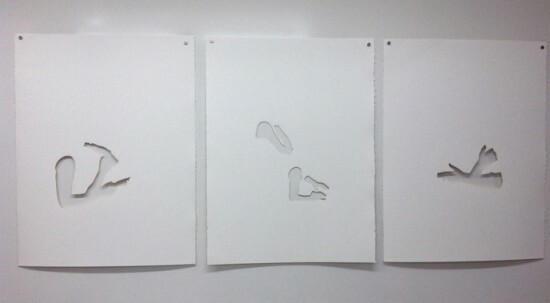 Not only is Campbell interested in interrogating gender performance, but she is also visibly invested in the silences of queer history, as seen in her new and never-before-exhibited laser-cut Ever Your Friend Silhouette series. Developed during her month-long residence at the Lesbian Herstory Archives in Brooklyn, Campbell culled images from the archives as the source material for her minimalistic series. Rather than blatantly reusing the photographs, Campbell cut out only the hands, arms and held objects such as a cigarette or a drink on stark white paper. Forcing the viewer to fill in the absences in the works, Campbell mirrors the invisibility of lesbians in both dominant and even, mainstream gay history. Representing the lost histories of desire and relations between these women in the Archive, Campbell creates a space where these narratives can perhaps be reimagined. Like her Ever Your Friend Silhouette series, Campbell’s sculpture A Pocket, A Cue, A Shot also examines alternate histories through the sexual politics of gay bars. 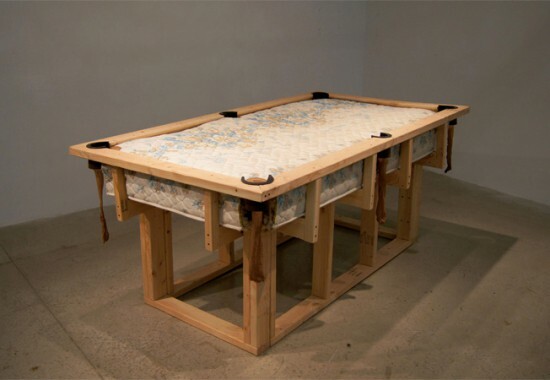 A Pocket, A Cue, A Shot turns the traditional pool table into a pseudo-bed, placing a bare mattress on the top of the table. In addition to the mattress, which certainly is not subtle in its meaning, Campbell also lines the table’s pockets with stockings, which resemble vaginas, recalling Eva Hesse’s body-like installations. Unveiling the sexual overtones in bar games such as pool, Campbell conflates the private desires and public socializing in bars. Intimate and fraught with sexual potential, the sculpture reminded me of Boots of Leather, Slippers of Gold: The History of a Lesbian Community, which studies the historical importance of lesbian bars in Buffalo, New York in the 1930s and 1940s. Speaking of historical queer spaces, perhaps my favorite work in the exhibition is Vanishing Point. With a silver balloon tied to a long piece of balsa wood, Vanishing Point resembles one of the Hudson River piers such as the Christopher Street pier, which has a long, if disappearing, queer history, particularly for queers of color. 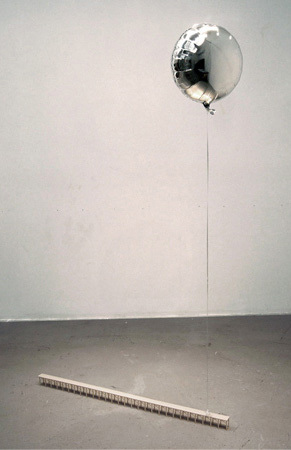 As the balloon will most certainly not last forever, Vanishing Point comments on the ephemerality of these queer spaces. Not only highlighting the vanishing of these spaces, Vanishing Point with the vibrant, reflective balloon, also seems to point to a distant utopian point in the future. As Muñoz states in Cruising Utopia, “We may never touch queerness, but we can feel it as the warm illumination of a horizon imbued with potentiality. We have never been queer yet queerness exists for us as an ideality that can be distilled from the past and used to imagine a future” (1). Whether mining the past in the Lesbian Herstory Archives or often ignored everyday objects, Campbell’s art seems to work within Munoz’s utopian framework, pointing to that potential horizon. 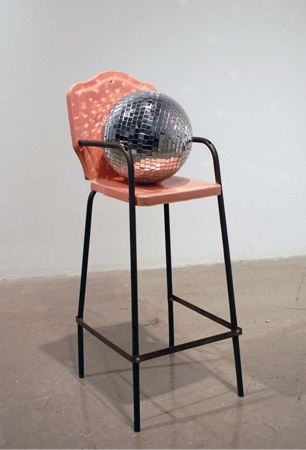 I mean, what could be more utopian than a discoball in a high chair! Tags: Anna Campbell, BOSI Contemporary, Cruising Utopia, discoball obsession, Etiquette Kit, gender performance, Jose Esteban Munoz, queer conceptualism, queer nightlife. Bookmark the permalink.